James Anderson Dunn-1 was born on 15 Oct 1817. He died on 25 Jun 1893. He married Mary P. Mcanelly on 27 Jun 1839, daughter of Littleberry Mcanelly and Dicey Bevel. She was born on 20 Aug 1819 in Roberson, Tennessee. She died on 25 Jun 1903 in Williamson, Illinois. William D. Dunn, B: 05 Feb 1842 in Williamson, Illinois, D: 05 Mar 1912 in Marion, Illinois, M: Mary S. Gulledge, 22 Apr 1866. John Riley Dunn, B: 1844, D: 1879. Charles Willis Dunn, B: 25 Sep 1849, D: 03 Nov 1912. Anna Luticia Dunn, B: 1847. James Wesley Dunn, B: 1850. Minerva Jane Dunn, B: 1853. Thomas F. Dunn, B: 1864. Henry W. Dunn, B: 31 Mar 1858, D: 08 Nov 1935. William D. Dunn-2(James Anderson-1) was born on 05 Feb 1842 in Williamson, Illinois. He died on 05 Mar 1912 in Marion, Illinois. 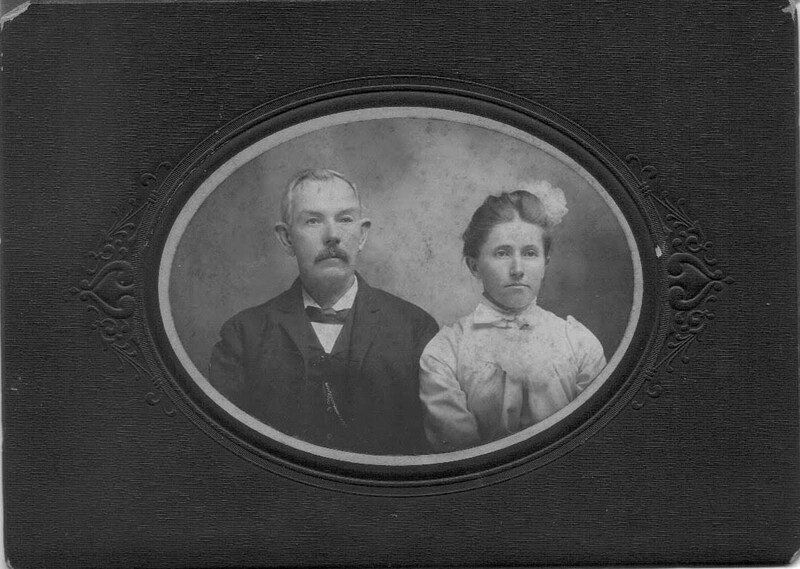 He married Mary S. Gulledge on 22 Apr 1866, daughter of William F. Gulledge and Phoebe Dorris. She was born on 03 Jun 1849 in Tennessee. She died on 17 Apr 1881 in Williamson, Illinois. He married Lizzie Sims. Cora M. Dunn, B: 20 May 1880 in Williamson, Illinois, D: 28 Aug 1959 in Marion, Illinois, M: Levander A. Goley, 09 Oct 1898. Charley Dunn, B: 1873, D: 08 Sep 1875. Sherman Dunn, B: 1874, D: 14 Oct 1875. Charles Willis Dunn-2(James Anderson-1) was born on 25 Sep 1849. He died on 03 Nov 1912. He married Susan E.She was born on 17 Mar 1850. She died on 30 Oct 1908. B. F. Dunn, B: 18 Apr 1884, D: 03 Jul 1926. Cora M. Dunn-3(William D.-2, James Anderson-1) was born on 20 May 1880 in Williamson, Illinois. She died on 28 Aug 1959 in Marion, Illinois. She married Levander A. Goley on 09 Oct 1898, son of Jacob Moake and Mary E. Gourly. He was born on 30 May 1873 in Williamson, Illinois[1, 2, 3]. He died on 19 Jul 1938 in Williamson, Illinois. Lora F. Goley, B: 1915. Lela Goley, B: 09 Jul 1906 in Williamson, Illinois, D: 10 Jun 1996 in Marion, Illinois, M: Theron Simmons Sr., 28 Feb 1929 in Benton, Illinois. Elva L. Goley, B: 1917. Lela Goley-4(Cora M.-3, William D.-2, James Anderson-1) was born on 09 Jul 1906 in Williamson, Illinois. She died on 10 Jun 1996 in Marion, Illinois. She married Theron Simmons Sr. on 28 Feb 1929 in Benton, Illinois, son of Milton Holloway Simmons and Gurtrude Ann Chamness. He was born on 31 Oct 1905 in Williamson, Illinois. He died on 26 Dec 1997 in Marion, Illinois.